Weeeeeelcome back, everybody! Hope you’re all ready for speedster shenanigans, because The Flash’s fifth season... has them. Literally all the seasons have them. Usually they involve Barry doing something dumb, but Barry is in the clear this episode — it’s his progeny that’s causing trouble. As I’m sure any viewers of this show will remember, last season ended on the reveal that the girl we’d been seeing at odd moments all season long was, as most people predicted, Barry and Iris’s daughter from the future. I guess making stupid time travel mistakes is genetic, huh? Let’s hope Nora doesn’t go around erasing babies from existence like dear old dad did. Writing this from the perspective of having already watched it, I can come right out and say that this fifth season opener is fine. It’s not spectacular, it’s certainly not bad, but it fits somewhere in a comfortable middle that allows me to keep hoping for the best despite all the instances of this show delivering the worst. It sets up enough to be a good premiere, while containing enough to work well as a standalone episode. 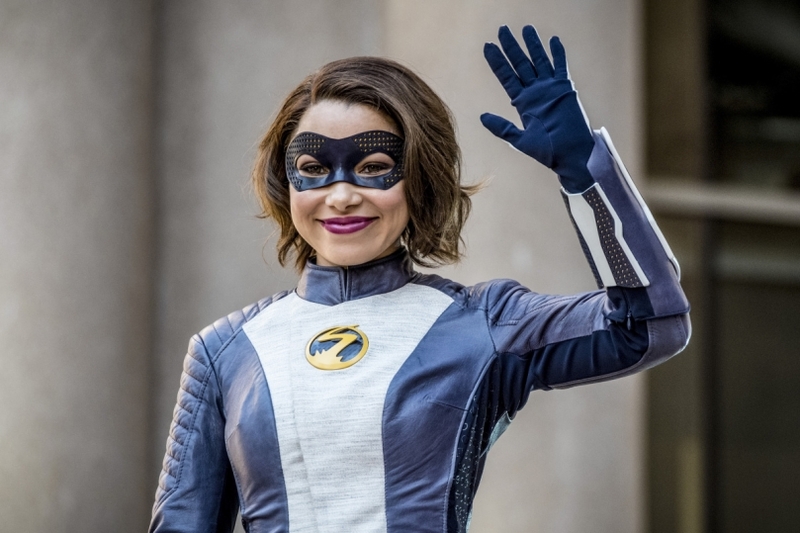 It’s not as hilarious as The Flash episodes of the past, nor as thrilling or well-crafted, but it works, and I look forward to seeing more of Nora in the future. Ha! Future. Because she’s from the future. Heh. The episode starts with Nora doing her version of the voiceover Barry usually does, introducing herself as XS, “The Guardian of Central City” and “The Fastest Woman Alive” 30 years into the future. She does another voiceover at the end (I have a feeling it’s mimicking the voiceover from the pilot episode, but I haven’t checked), and these just serve as a nice touch whenever the show wants to imply focus on another character’s point of view without making a big deal out of it. As the title suggests, this is Nora’s episode. It all revolves around her impact on the team and the timeline, why she’s there, and what news of the future she can bring our heroes (whether they want to know that news or not). Nora lets everyone believe she’s stuck in their time, so they have to figure out why before she can go home. She gets to make a couple laps in the Speed Lab while Caitlin analyzes her biometrics and Cisco drunkenly (he imbibed a tad too much champagne at Joe and Cecile’s party) analyzes her connection to the Speed Force. Wally, who’s still hanging around after meeting his new half-sibling, goes to the Legends for insight, and maybe a ride home on their time ship. Like any over-enthusiastic super fan, Nora tries to involve herself in her hero’s business. Unfortunately, her hero’s business is saving the city, and Nora’s more a hindrance than a help for Barry. When a call comes in (old-school police radio style, since all of STAR Labs’ tech is still offline from the DeVoe crisis) and Barry goes out to face meta-of-the-week Gridlock, Nora follows him and Gridlock escapes because she distracts Barry. Nora tells everyone that Gridlock wasn’t supposed to escape, that he was a simple “one and done” meta, and blames herself for messing up the timeline. Team Flash gets the idea to use tachyon enhancers to get Nora up to speed so she can make it back home. As she and Barry are readying for the trip, she tells everyone goodbye. Iris gets a throwaway farewell and Barry gets a hug, further hinting at a serious bias on Nora’s part regarding her parents. Nora and Barry head off, just missing the return of Wally with a warning — turns out, Nora’s suffering from a nasty case of Negative Tachyons, and Barry and Nora are both flung back mid-run. Nora is recovering in the Lab’s infirmary and undergoing more tests. On the news, Gridlock is terrorizing the city and, again, Team Flash didn’t know because they don’t have their fancy scanners anymore. Barry makes an appearance, but the crime is pretty much over and the team is left to deal with the aftermath. Apparently, Gridlock’s power is to absorb kinetic energy and increase his powers. If he keeps moving, he becomes unstoppable. The name is ironic, guys! Back to the West-Allen family time travel drama: Iris confronts Barry about his response to Nora, calling him out on his sudden opposition to time travel hijinks. You’re a hypocrite, Barry! A hypocrite! Unless, of course, Barry’s problems with Nora have nothing to do with affecting the timeline. Which they don’t. It’s all about the family stuff, not the Speed Force stuff. Barry feels like he’s missing out on all the “firsts” that come with being a dad by meeting Nora as an adult. Barry wanted just one thing in his life — starting a family with Iris — to be done in the right order, without all any timey-wimey nonsense. As ever, Iris is the voice of reason, explaining that the visit from Nora means they’ve gained something on top of all those firsts Barry is looking forward to experiencing, and that he’ll be there for all of those fatherhood firsts regardless of what order they experience life in. Oh. Wait, what’s that? I believe it’s the sound of the Irony Train coming ‘round the bend. Hello, Irony Train! What heartbreaking cargo have you brought with you this trip? So, Nora’s weird behavior around Barry, her fangirlish nature, the way she rattles off facts like she read them in a book rather than heard them from her hero in person? All that’s because Barry’s missing in the future, per that newspaper article that first appeared as a plot device back in season one. Barry was worried that meeting Nora meant she’d spoiled all those firsts, but Nora’s only there because Barry never got to experience those firsts anyway. She isn’t actually stuck; she intentionally trapped herself in the past because she wanted to meet her dad. With Gridlock on a rampage, though, Barry doesn’t have time to deal with his family drama. The meta villain is planning on crashing a plane into Central City so he can absorb the kinetic energy and gain more power. Or steal jewels, which is also implied. Both? Anyway, Team Flash quickly formulates a plan. The crashing plane has a brief window of zero Gs, during which Gridlock won’t have powers and they’ll be able to cuff him, which they do. But the plane’s still crashing — so Barry, Wally, and Nora will have to phase the plane through obstacles. The problem is, Nora doesn’t know how to phase, which means Barry gets to be around for one of her firsts after all. He talks her through the whole thing, using the words of Thawne-Wells in a clever little editing effect. Barry, Wally, and Nora successfully save the plane, phasing it through a few buildings and a bridge before allowing it to make a water landing. In the end, Gridlock is on his way to Iron Heights and Nora accepts that she should go home. But Barry, knowing that he actually won’t be a part of his daughter’s life, has changed his mind and wants her to stay. He convinces everyone else, and I guess Barry’s just really good at convincing people of stuff because they all agree despite the problems this could cause in the future. Then again, they’ll never know about timeline changes, will they? Drunk Cisco was perfect. Hungover Cisco was also perfect. Joe didn’t do much this episode, but between his unenthused “awesome” at Cecile not losing her powers, taking naps in the secret lab lounge he’s known about since “day one,” and his immediate acceptance of Nora as his granddaughter, he’s still the best. Someone please help Iris with her movie knowledge! Holy crap, CCPD, did you not do any CSI work while Barry was away? How many murderers and arsonists did your laziness allow to walk free? “If Eddie wanted to erase Thawne from existence, why didn’t he just have a vasectomy?” If Ralph’s role this season is just listing all this show’s plot holes, I no longer hate him. “There you go, Billy Pilgrim. Consider yourself unstuck in time.” Sweet Vonnegut ref, Cisco. Oh, hey, Caitlin’s dad faked his death. The end of the episode introduces our villain-of-the-season, Cicada. He doesn’t seem like a pleasant fellow.